Objective: To develop, in patients referred for syncope to an emergency department (ED), a diagnostic score to identify those patients likely to have a cardiac cause. Setting: ED of 14 general hospitals. Patients: 516 consecutive patients with unexplained syncope. Interventions: Subjects underwent a diagnostic evaluation on adherence to Guidelines of the European Society of Cardiology. The clinical features of syncope were analysed using a standard 52-item form. In a validation cohort of 260 patients the predictive value of symptoms/signs was evaluated, a point score was developed and then validated in a cohort of 256 other patients. Main outcome measurements: Diagnosis of cardiac syncope, mortality. Results: Abnormal ECG and/or heart disease, palpitations before syncope, syncope during effort or in supine position, absence of autonomic prodromes and absence of predisposing and/or precipitating factors were found to be predictors of cardiac syncope. To each variable a score from +4 to –1 was assigned to the magnitude of regression coefficient. A score ⩾3 identified cardiac syncope with a sensitivity of 95%/92% and a specificity of 61%/69% in the derivation and validation cohorts, respectively. During follow-up (mean (SD) 614 (73) days) patients with score ⩾3 had a higher total mortality than patients with a score <3 both in the derivation (17% vs 3%; p<0.001) and in the validation cohort (21% vs 2%; p<0.001). Conclusions: A simple score derived from clinical history can be usefully employed for the triage and management of patients with syncope in an ED. To evaluate, in an unselected population of patients referred urgently to a general hospital, the clinical presentation of syncope and to develop a diagnostic point score in order to identify, early in the initial evaluation, those patients who are likely to have a cardiac cause of syncope. To establish the prognostic value of the score for the triage and management of patients with syncope in ED. The study included consecutive patients admitted to the ED of 14 general hospitals in Italy from 4 October 2004 to 5 November 2004 because of a transient loss of consciousness which, on the initial evaluation, was ascribed to a syncopal condition. The patients comprised those enrolled in the Evaluation of Guidelines in SYncope Study 2 trial (EGSYS-2).3 Patients enrolled between the beginning of the study and 15 October 2004 were assigned to the derivation cohort, patients enrolled between 16 October 2004 and the end of the study were assigned to the validation cohort. Patients with a definite non-syncopal cause of loss of consciousness on the initial evaluation (as seizures, drop attacks, transient ischaemic attacks, etc), those aged <18 years and those referred >24 h after their episode were excluded. All patients underwent the diagnostic evaluation with strict adherence to the recommendations of the guidelines of the European Society of Cardiology (ESC); details are reported elsewhere.4 Diagnostic tests were performed, when appropriate, according to the current guidelines.4 To maximise the application of the guidelines decision-making software based on the ESC guidelines (EGSYS software version 1.0) was used. The central clinical monitors—that is, cardiologists who are expert in syncope management, supervised the entire process, verified adherence to the diagnostic pathway for all patients and gave advice on any corrections deemed necessary. The clinical findings of syncope were analysed, taking into account the last syncopal episode, with a standardised form designed to identify 52 findings of the index syncopal episode; a detailed description has been given previously.3 Data were collected on precipitating and predisposing factors, prodromal and recovery symptoms and physical signs during loss of consciousness and the recovery phase. Patients were considered to have heart disease in the following cases: (a) previous clinical or laboratory diagnosis of any form of structural heart disease, including ischaemic heart disease, valvular dysfunction, myocardiopathies and congenital heart disease; (b) previous diagnosis or clinical evidence of congestive heart failure; (c) physical signs of structural heart disease. The ECG was evaluated by the ED doctor and subsequently reviewed by a expert cardiologist and was considered abnormal in the following cases: sinus bradycardia, atrioventricular block greater than first degree, bundle branch block, acute or old myocardial infarction, supraventricular or ventricular tachycardia, left or right ventricular hypertrophy, ventricular pre-excitation, long QT and Brugada pattern. Diagnostic criteria of the causes of syncope were developed before recruitment on the basis of the best evidence-based recommendations, and assignment of a cause was based on strict adherence to these criteria.4 In particular mechanical cardiac syncope was diagnosed in the presence of severe valvular stenosis, or other flow obstruction, or when symptoms were present with ECG evidence of acute myocardial ischaemia. Arrhythmic syncope was diagnosed on the basis of a standard ECG, ECG monitoring, 24-h Holter recordings, or during the electrophysiological study. The following findings of a standard ECG were considered diagnostic: sinus bradycardia <40 bpm or repetitive sinoatrial blocks or sinus pauses >3 s; Mobitz 2 or advanced (2:1, 3:1, etc.) second-degree atrioventricular (AV) block or third-degree AV block; alternating left and right bundle branch block, pacemaker malfunction with cardiac pauses, rapid paroxysmal supraventricular or ventricular tachyarrhythmias. The following findings of a 24-h Holter recording were considered diagnostic: any arrhythmia associated with syncope, or, in the absence of neurological symptoms, ventricular pauses longer than 3 s when awake, Mobitz 2 second-degree, or advanced-degree, or third-degree AV block; rapid paroxysmal ventricular tachyarrhythmias. The following electrophysiological findings were considered diagnostic: sinus bradycardia and corrected sinus node recovery time >1 s; baseline HV interval ⩾100 ms, or appearance of infra-Hisian second- or third-degree AV block during atrial pacing, or after ajmaline administration; induction of sustained monomorphic ventricular tachycardia and induction of syncopal or hypotensive supraventricular tachyarrhythmias. Exercise testing was diagnostic when ECG abnormalities were present and syncope was reproduced during the exercise, or immediately after the exercise, or when Mobitz 2 second-degree or third-degree AV block developed during exercise even without syncope. The Student t test for unpaired data was used for comparison of continuous data between groups. The χ2 method or Fisher test was used to compare categorical variables, as appropriate. To develop a score predictive of cardiac syncope binary variables were created from continuous variables using as cut-off point the mean for normally distributed variables and the median for skewed variables. Variables with similar meaning were combined to reduce the number of variables to be included in the logistic regression analysis. The logistic regression test was used to determine which variables were independent predictors of the cardiac cause of syncope. Results are shown as odds ratio with 95% CIs. 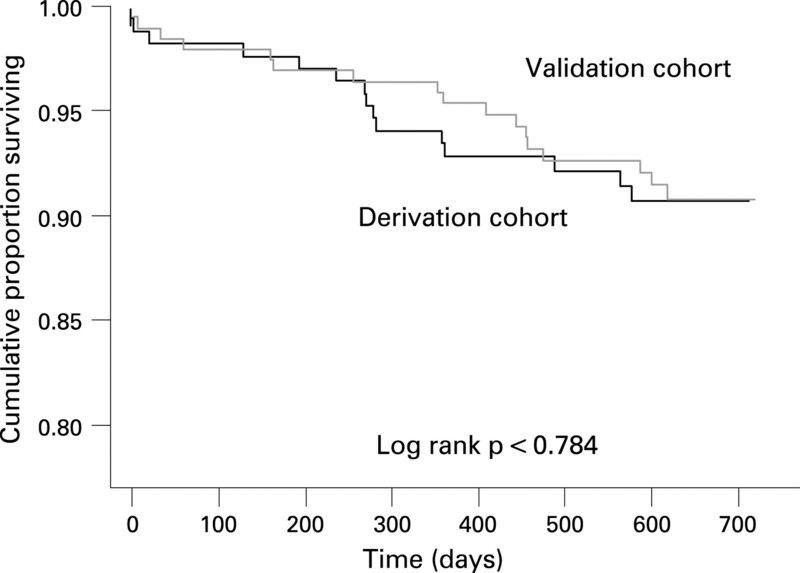 Univariate predictors of cardiac syncope were identified by χ2 analysis. Variables with a univariate correlation with a p value <0.10 were considered in stepwise logistic regression analyses with a cut-off p value of <0.05. A point score was developed using those variables that had been found to be significant independent predictors of cardiac syncope, assigning positive or negative values to each variable based on the relative magnitude of the regression coefficient. The points were summed and a diagnostic threshold was chosen using receiver operating curve (ROC) analysis. The increasing risk of cardiac syncope with ascending score was evaluated with the χ2 for trend analysis. A p value of ⩽0.05 was considered significant. Survival was evaluated in separate Kaplan–Meier models. The data were analysed with the Statistica software version 7.0 and with SPSS version 11.5. During the recruitment period, data from 541 patients were collected. In this study we analysed the data of the 516 patients (95%) for whom a diagnostic investigation consistent with ESC guideline recommendations was available. At the end of the diagnostic evaluation a neurally mediated cause of syncope was established in 344 (67%), orthostatic hypotension in 52 (10%), primary cardiac arrhythmias in 56 (11%), structural cardiac or cardiopulmonary disease in 23 (4%). The cause of syncope remained unexplained in 13 (3%) patients. In three patients a loop recorder was implanted at the end of an inconclusive clinical investigation: during follow-up syncope recurred in one patient with documented long asystolic pause after termination of paroxysmal atrial fibrillation. In 28 (5%) patients non-syncopal cause of loss of consciousness was confirmed by investigations. These were electroencephalography, brain computed tomographic scan and magnetic resonance imaging in the case of epilepsy and transient vertebrobasilar attack; laboratory blood tests in the case of hypoglycaemia and intoxication and reappraisal—including psychiatric consultancy—in the case of falls and psychogenic pseudosyncope. Table 1 shows the demographic and clinical characteristics of the derivation and validation cohorts. The validation cohort had baseline characteristics similar to those of the derivation cohort except for a higher proportion of patients who were female and a greater vasovagal cause of syncope in the validation cohort. Table 2 shows the diagnostic tests employed to confirm a cardiac cause of syncope in the whole group. Table 3 shows in the derivation cohort, among 52 clinical variables, those which significantly predicted cardiac syncope on univariable analysis. Table 4 reports the independent predictors of cardiac syncope on multivariable analysis. To each variable a point score was assigned on the basis of the regression coefficient (table 4). Figure 1 shows the ROC analysis of the diagnostic scores. The area under the curve (AUC) was 0.904 (95% CI 0.864 to 0.943), indicating a good discriminant ability. A point score ⩾3 was considered the best discriminator for a diagnosis of cardiac syncope. The sensitivity and specificity for diagnosis of cardiac syncope were 95% (95% CI 84.5% to 99.4%) and 61% (95% CI 54.3% to 67.7%), respectively. The predictive positive value and the predictive negative value were 33% (95% CI 29.9% to 34.5%) and 99% (95% CI 95.3% to 99.6%), respectively. The positive and the negative likelihood ratio were 2.5 (95% CI 2.1 to 2.6) and 0.07 (95% CI 0.02 to 0.24), respectively. A score >4 had a sensitivity and a specificity of 32% (95% CI 18.6% to 47.6%) and 99% (95% CI 96.7% to 99.9%) for the diagnosis of cardiac syncope. The predictive positive value and the predictive negative value were 88% (95% CI 65.5% to 96.5%) and 87.7% (95% CI 86.3% to 88.3%), respectively. The positive and the negative likelihood ratio were 34.4 (95% CI 9.3 to 133.7) and 0.68 (95% CI 0.65 to 0.78), respectively. Assuming a cut-off score >2, >3 and >4 the AUC were respectively 0.802, 0.833, 0.623 (p = NS score >2 vs score >3; p<0.001 score >3 vs score >4; p<0.003 score >2 vs score >4). Figure 1 Receiver operator characteristic analysis of the EGSYS score in the derivation (A) and validation cohorts (B). Dotted lines define the 95% confidence intervals. Figure 2 shows the risk of cardiac syncope with an increasing score. Figure 2 Probability of cardiac syncope according to the EGSYS score in the derivation and validation cohorts. In the validation cohort the sensitivity and specificity of a score ⩾3 for diagnosis of cardiac syncope were 92% (95% CI 76.9% to 98.2%) and 69% (95% CI 62.7% to 75.2%), respectively. The predictive positive value and the predictive negative value were 32% (95% CI 27.5% to 34.0%) and 98% (95% CI 95.2% to 99.3%), respectively. The positive and the negative likelihood ratio were 2.97 (95% CI 2.40 to 3.25) and 0.12 (95% CI 0.04 to 0.32), respectively. The area under the ROC curve in the validation cohort was 0.849 (95% CI 0.778 to 0.921), which was not significantly different from the findings in the derivation cohort. This result confirmed the predictive ability of the score in the validation cohort. Figure 2 shows the risk of cardiac syncope with an increasing score. A score >4 had a sensitivity and a specificity of 29% (95% CI 14.6% to 46.3%) and 99% (95% CI 96.1% to 99.7%), respectively. The predictive positive value and the predictive negative value were 77% (95% CI 51.4% to 91.6%) and 90% (95% CI 88.3% to 90.5%), respectively. The positive and the negative likelihood ratio were 21.0 (95% CI 6.67 to 69.13) and 0.72 (95% CI 0.66 to 0.83), respectively. Assuming a cut-off score >2, >3 and >4 the AUC were respectively 0.781, 0.787, 0.674 (p = NS score >2 vs score >3, score >3 vs score >4 and score >2 vs score >4). Of 516 patients evaluated according to the ESC guidelines, the follow-up data were completed in 363 (70%) patients, 168 (65%) of the derivation and 195 (76%) of the validation cohort. Of patients lost to follow-up, diagnosis of cardiac syncope, admission rate and death during hospitalisation were similar (19%, 40% and 1.3%, respectively) to those of patients who remained in the study (16%, 39% and 1.3%, respectively). Death from any cause occurred in 32 patients: 15/168 (9%) in the derivation and 17/195 (9%) in the validation cohort (fig 3). In the derivation cohort death was considered cardiovascular in four (27%), non-cardiovascular in seven (46%) and of unknown origin in the other four patients (27%). In the validation cohort death was considered cardiovascular in five (29%), non-cardiovascular in two (12%) and of unknown origin in the other 10 patients (59%). In the derivation and validation cohorts an EGSYS score ⩾3 was found, respectively, in 80% and 82% of patients who died versus 20% and 18% of patients who survived (p<0.001). 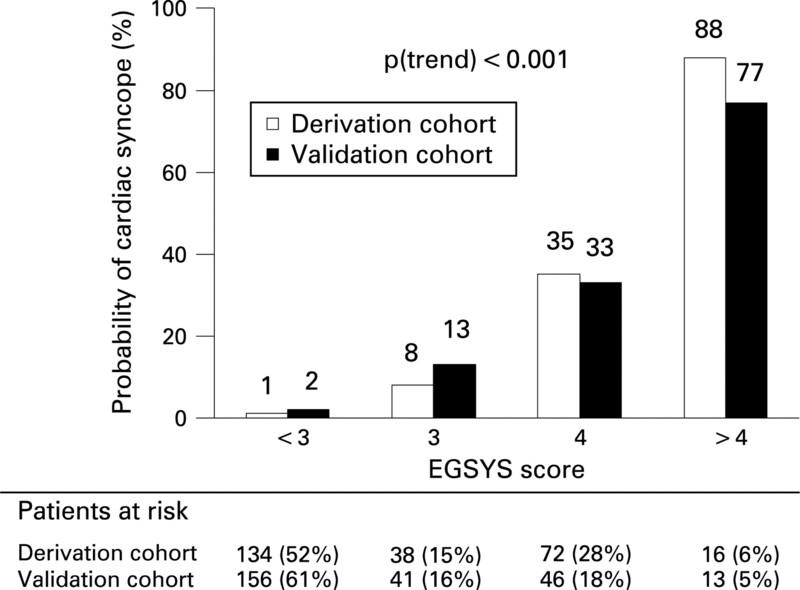 At 2 years, the patients with an EGSYS score ⩾3 had a mortality of 17% and 21% in the derivation and validation cohorts, respectively; these mortality rates were significantly higher than those seen in patients with a score <3 which were 3% and 2%, respectively (p<0.001) (fig 4). Moreover all five patients who died in the first month of follow-up had an EGSYS score ⩾3. Figure 3 Kaplan–Meier survival curves in the two study cohorts. Figure 4 Kaplan–Meier survival curves according to the score at presentation in the derivation (A) and validation (B) cohorts. In our study the guideline-based approach provided an excellent diagnostic yield and it probably represents the current standard for the management of syncope. Indeed, the cause of syncope remained unexplained in only 3% of patients. To increase the diagnostic value of predictors of cardiac syncope we developed a point score that has a high sensitivity and maintains a good specificity. The results of this study indicate that the clinical features of syncope obtained during the initial evaluation in an ED can be used to develop a score that helps to identify patients at higher risk of cardiac syncope. In an ED, where the doctor is rarely an expert in the management of patients with syncope, the test should be used for screening, and priority should be given to a diagnostic cut-off point offering a high predictive negative value for cardiac syncope and a low risk of death (score <3) (fig 5). In the presence of a score ⩾3 the probability of cardiac syncope and mortality are important and therefore the patients should be admitted to hospital and priority given to confirming this diagnosis and hopefully saving life. Figure 5 A proposed flow diagram for the evaluation of patients with syncope referred to an Emergency Department. The EGSYS score can be used to select high-risk patients requiring hospitalisation and cardiac evaluation. In a referral centre, a diagnostic cut-off point with positive predictive value (score >4) is required in order to confirm the diagnosis.14 A point score >4 yielded a higher predictive value, with 88% of the patients in derivation and 77% of those in validation cohort having an established diagnosis of cardiac syncope. These patients would therefore be managed intensively—probably in an intensive cardiac care unit—until the diagnosis is confirmed and treatment started. Nevertheless, only a decision rule which is virtually 100% sensitive and has an extremely narrow confidence interval can supersede clinical judgment. Therefore, in our opinion, the ECGYS score cannot be used as a substitute for the clinical judgment of the experts of syncope management but as an aid for ED doctors; the score may help to increase their self-confidence in their judgment, improving the efficiency of their decision-making. In the OESIL score long-term total mortality (1 year) increased significantly in patients with age >65 years, history of cardiovascular disease, lack of prodromes and abnormal ECG.19 However, the presumption than an immediate in-hospital evaluation improves the patient’s long-term clinical outcome has never been demonstrated. Few reports exist to guide the clinician in cases of exertional syncope in young patients. This is an uncommon occurrence, usually with a very different aetiology than syncope in an older patient. Possible causes include hypertrophic cardiomyopathy, coronary artery abnormalities, conduction abnormalities (long QT, pre-excitation syndromes) and catecholaminergic polymorphic ventricular tachycardia. The previously mentioned scores are unable to identify these high-risk patients. The EGSYS score, however, identifies patients with syncope during effort as high risk even in the absence of an abnormal ECG or structural heart disease. Only 53–56% of patients with syncope in the community reported seeing a doctor or visiting a hospital for evaluation.5 20 Therefore the present data cannot be applied to the general population of patients with transient loss of consciousness. In syncope no diagnostic “gold standard” has been determined and diagnosis often remains presumptive. Although the diagnostic criteria adhered strictly to the recommendations of the ESC guidelines, another competitive diagnosis cannot be rule out in some cases. The score has been validated in a population with a diagnosis derived from conventional examinations. In our study a loop recorder was implanted in only three patients at the end of diagnostic investigation. Recently, Pezawas et al showed that in unexplained syncope the arrhythmic events documented by the implantable loop recorder were equally distributed in patients with and without structural heart disease.21 Asystolic syncope was documented in only 15% of patients with structural heart disease. Nevertheless, these authors selected a population of patients with mild left ventricular systolic dysfunction and no intraventricular conduction disturbances. On the contrary in patients with bundle branch block and negative electrophysiological study, most syncopal recurrences have a homogeneous mechanism that is characterised by prolonged asystolic pauses, mainly attributable to sudden-onset paroxysmal AV block.22 The EGSYS score needs to be validated in an external population: this is the object of a continuing study. In our score we do not include the determination of some biomarkers such as troponins and NT-pro-BNP. In a population of adult patients who presented to an ED after a syncopal event a raised troponin T level was found to be highly specific for adverse cardiac outcome, but with a very low sensitivity.23 In a recent study, assessment of NT-pro-BNP was helpful in differentiating cardiac from non-cardiac syncope.24 In another study, BNP testing showed it to be an independent predictor of adverse outcome in patients with syncope presenting to an ED.25 Further studies are required to define the role of biomarkers in the diagnostic algorithm of syncope in order to improve their sensitivity and specificity. 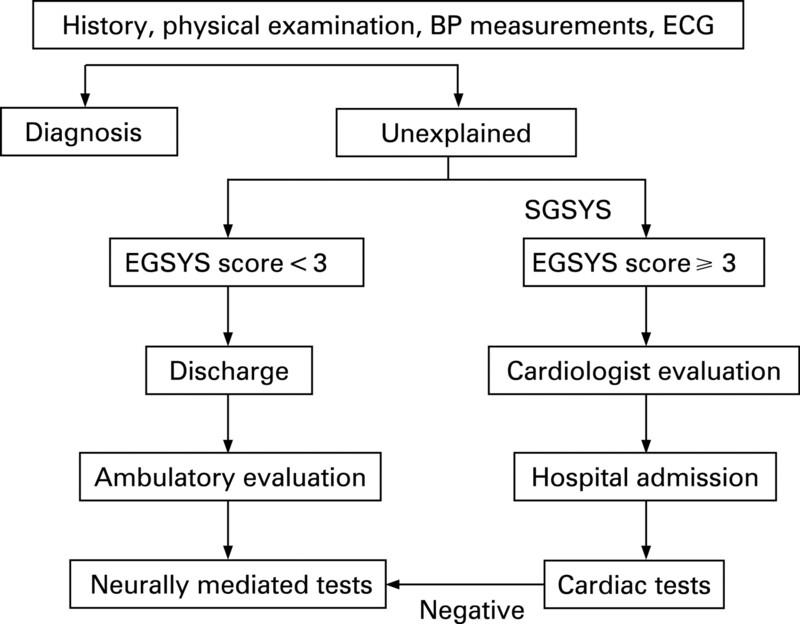 The EGSYS score is a simple diagnostic score derived by historical findings and appears to be sensitive for identifying patients with cardiac syncope. This may offer a tool to aid doctors in decision-making. Organisational support was provided by Fondazione Medtronic Italia.
. Evaluation and outcome of emergency room patients with transient loss of consciousness. Am J Med 1982;73:15–23.
. Patients with syncope admitted to medical intensive care units. JAMA 1982;248:1185–9.
. A new management of syncope: prospective systematic guideline-based evaluation of patients referred urgently to general hospitals. Eur Heart J 2006;27:76–82.
. Task Force on Syncope, European Society of Cardiology. Guidelines on management (diagnosis and treatment) of syncope-update 2004. Europace 2004;6:467–537.
. Incidence and prognosis of syncope. N Engl J Med 2002;347:878–85.
. Evaluation and outcome of patients with syncope. Medicine (Baltimore) 1990;69:169–75.
. Syncope of unknown origin. JAMA 1982;247:2687–91.
. Diagnostic value of history in patients with syncope with or without heart disease. J Am Coll Cardiol 2001;37:1921–8.
. Prospective evaluation of patients with syncope: a population-based study. Am J Med 2001;111:177–84.
. Prospective evaluation and outcome of patients admitted for syncope over 1 year period. Eur Heart J 2002;23:815–20.
. Risk stratification of patients with syncope in an accident and emergency department. Emerg Med J 2002;19:23–7.
. Relation of clinical presentation of syncope to the age of patients. Am J Cardiol 2005;96:1431–5.
. The value of the clinical history in the differentiation of syncope due to ventricular tachycardia, atrioventricular block, and neurocardiogenic syncope. Am J Med 1995;98:365–73.
. Selection and interpretation of diagnostic tests and procedures. Ann Intern Med 1981;94:555–600.
. A risk score to predict arrhythmias in patients with unexplained syncope. Acad Emerg Med 2003;10:1312–7.
. Diagnostic criteria for vasovagal syncope based on a quantitative history. Eur Heart J 2006;27:344–50.
. The San Francisco Syncope Rule vs physician judgment and decision making. Am J Emerg Med 2005;23:782–6.
. External validation of the San Francisco Syncope Rule. Ann Emerg Med 2007;49:420–7.
. OESIL (Osservatorio Epidemiologico sulla Sincope nel Lazio) Study Investigators. Development and prospective validation of a risk stratification system for patients with syncope in the emergency department: the OESIL risk score. Eur Heart J 2003;24:811–9.
. Encuesta nacional: síncope. Conductas diagnósticas y terapéuticas. Diagnóstico etiológico. Rev Fed Arg Cardiol 1998;27:277–90.
. Implantable loop recorder in unexplained syncope: classification, mechanism, transient loss of consciousness and role of major depressive disorder in patients with and without structural heart disease. Heart 2008;94:e17 doi:10.1136/hrt.2007.116616 [published Online First: 18 October 2007].
. Mechanism of syncope in patients with bundle branch block and negative electrophysiological test. Circulation 2001;104:2045–50.
. Relative utility of serum troponin and the OESIL score in syncope. Emerg Med Australas 2005;17:31–8.
. NT-pro-BNP for differential diagnosis in patients with syncope. Int J Cardiol (in press).
. Role of brain natriuretic peptide (BNP) in risk stratification of adult syncope. Emerg Med J 2007;24:769–73. Funding: This study was supported by a grant from Gruppo Italiano per lo Studio della Sincope (GIMSI). Competing interests: Declared. TDS is an employee of Medtronic Italia. The other authors have no conflict of interest. Ethics approval: Ethics committee approval received.